But ’twill take root and flourish still, tho’ under foot it’s trod. For the past forty years, it has been easy to think that the Church has been diminishing, that the culture of life was being eroded by the popular culture of death, and that faith seemed to be slowly dying with the demise of an older generation. It would be easy to think this, especially if one read the paper or watched television. I recall one time when I was in graduate school being told by my astonished professor that people like me were supposed to be extinct. He said it regretfully, for being an old-school atheist, he missed the Catholic students that he used to attack so vigorously during his lectures. His anti-Catholic barbs were wasted on the rising generation of secular students. He was wistful for the arguments of the past. He need not have worried, for the Catholic Faith is far more robust than he supposed. For example, a most amazing thing happened on 8 February 2014 in Scarborough, Ontario. About 15 seminarians from St. Augustine’s seminary in Toronto played a hockey game against the same number of young men (aged 15 to 25) from the Lakefield/Douro-Dummer region, near Peterborough. 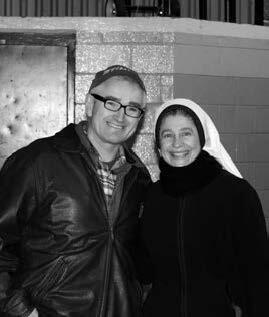 This event was a fundraiser for the Sisters of Life, an order that has a house in Toronto. It was organized by the sisters with the help of Frank Doyle (a business man from the area) and John Perdue (one of the seminarians) and was a great success. The game lasted about 90 minutes, and the hockey was high calibre and very fast. The stands were filled with almost 100 people including a dozen sisters, priests, young families, infants, children, grandparents, and young men and women. One of the priests who teach theology at the seminary played on the seminarian team, and held his own very well. It was more or less non-contact, although it was evident from the black eyes and cuts that adorned the players at the pizza dinner after the game that non-contact was taken with a grain of salt. The final score of 7 all is still controversial. This is a good news story on many levels. First, it was wonderful that the seminarians got to play against other young men, so that they and the rest of us from across southern Ontario could meet each other as well as the Sisters of Life. As with everything these sisters do, the event was an expression of real culture, where the culture of life meets the ordinary, and as such, it was genuine fun. Sister Maria Kateri dropped the puck, and did an impressive impromptu twirl in her figure skates. If we want to have a culture of life, we must build it ourselves, for who else is better suited to the task? This means organizing such simple things as hockey games. Catholic children should grow up with the lived experience of a life that is more fun inside the culture of Faith than that which is outside of it. We say it, we believe it, but we also must make it happen. 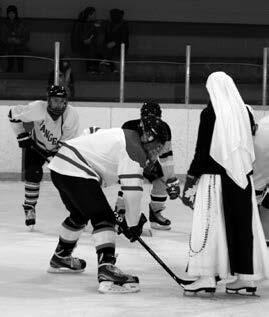 You will not read about the Sisters of Life and the seminarians from St. Augustine and this hockey game in the newspapers, or see it on television—some things are too important for television. 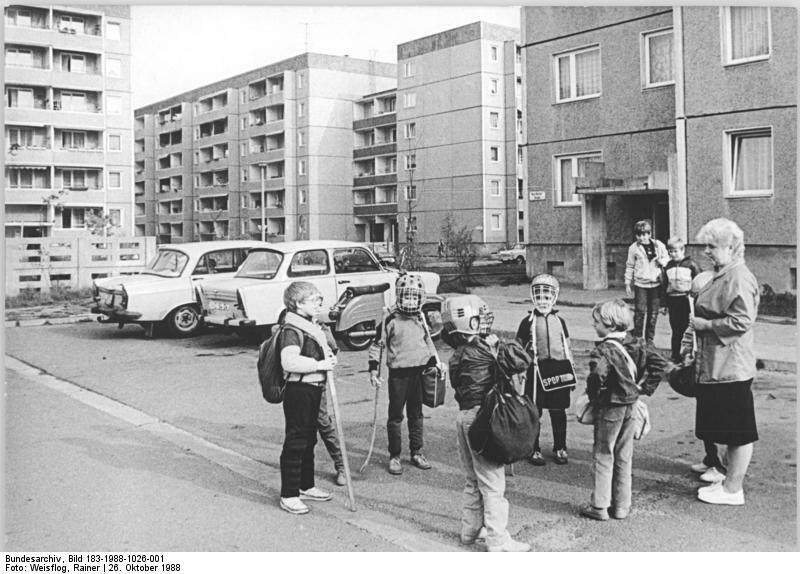 Photo credit: Bundesarchiv, Bild 183-1988-1026-001 / CC-BY-SA [CC-BY-SA-3.0-de (http://creativecommons.org/licenses/by-sa/3.0/de/deed.en)], via Wikimedia Commons.